St Alfege Church is a Church of England place of worship in the town centre of Greenwich in the eponymous London Borough. 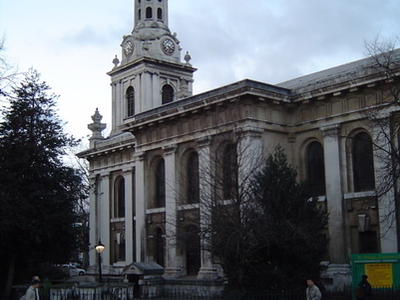 Of medieval origin, the church was rebuilt in 1712-14 to the designs of Nicholas Hawksmoor. 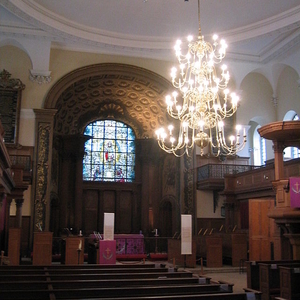 Following the collapse of the medieval church, the present building was constructed, funded by a grant from the Commission for Building Fifty New Churches, to the designs of Nicholas Hawksmoor, one of the commission's two surveyors. The first church to be built by the commissioners, it was begun in 1712, and basic construction was completed in 1714; it was not, however, consecrated until 1718. The church is rectangular in plan with a flat ceiling, and a small apse serving as a chancel. The east front, towards the street, has a portico in the Tuscan order. A central arch cuts through the entablature and pediment – a motif used in Wren's "Great Model" for St Paul's Cathedral. A giant order of pilasters runs around the rest of the church: a feature Kerry Downes suggests may have been added by Thomas Archer, who, according to the minutes of the commission, "improved" Hawksmoor's plans. To the north and south are wide projecting vestibules the full height of the church, with steps leading up to the doors. Hawksmoor planned a west tower, in the position of the existing one, which had survived the collapse. However the commission was reluctant to fund it, and the medieval tower was retained. In 1730 John James refaced it, and added a spire. Hawksmoor's design, published in an engraving in 1714 had an octagonal lantern at the top, a motif he was later to use at St George in the East. Here's the our members favorite photos of "Churches near Royal Borough of Greenwich". Upload your photo of St Alfege Church!